I am not sure where the time went butttttt final exams are in like a month. Cue epic freak out. Time to outline, write out flashcards and take practice exams until I'm blue in the face. Here is what I am doing to prepare and set myself up for success one month out from final exams. I have been pretty good about keeping up on outlines this semester... I am actually pretty proud of myself. However, with getting through the appellate brief, I did get a little behind. Therefore, I have spent the last week or so catching up. Property II is taking me the most time.... soooo much information. My goal is to have my outlines 100% a full week before finals. That way, I can just study, memorize and do practice exams that week and exam weeks. When I go back through my notes, I tend to find lots of holes. Or notes to myself such as "copy this from the powerpoint later" or "confusing AF" or even "you weren't paying attention; go see the teacher" (at least I am honest with myself when I daydream). As a result, come outlining/reviewing/study time, I need to fill in those holes and clear up any confusion. I make a point to go see professors and do this sooner rather than later. Last semester, one of my semesters was gone for the week before our final so any issues that came up we could only email him. This semester, I am trying to do all of this now so that I do not have that happen later on. Also, clearing up confusion helps me to have full, complete and correct outlines and study materials. Something different about studying law school exams compared to undergrad is you actually have to practice. As in practice multiple choice, essays, bar style, etc. The best scenario is getting old exams/old exam questions from your professor. Other options include study aid books, online aids, and bar prep companies (they provide first-year study aids). I like to print all of this out or bookmark the website and add anything printed to my exams binder (more on that in a moment). This way, if I have any spare time, I can do some of this (doubtful) and come finals time, it is right there ready to go. So I am an organization, color-coding, OCD crazy person. If things aren't organized and pretty, it stresses me out. Therefore: exam binder. Everything I need to study in one, organized place. I make a divider section for each exam and fill it will outlines, attack outline, study aids, practice questions, etc. I also keep a detailed study schedule and exam schedule with times and classrooms in the front so I always know what I need to be studying, where I need to be and when. At this point, I am starting to collect all of this into my binder. I made my exam schedule paper as the times are finally finalized and I am pulling together dividers, practice questions and study aids. It's never too early to be super duper organized. I am making a point to work on my own health now. You can't perform well on exams if you are not at your best physically and mentally. Therefore, I must be healthy going into finals and I want to start that now. I have been eating healthy, I finally forced myself back into working out, I am taking vitamins and making a point to get enough sleep. I do not want to roll into finals time exhausted, feeling yucky from crappy food and just strung out on life. I want to be feeling like a million bucks as I go into the two hardest weeks of the semester. Also, working on my health is never a bad idea. Eating healthy if good for me and my husband in general, doing Yoga a few times a week is really helping my flexibility and mindfulness and getting a good nights sleep is a glorious feeling that leaves me refreshed and happy. I wish you the best of luck! I absolutely love your blog!!!! Thank you for your advice on note taking and dealing with law school stress. I plan on going to law school after I have my year of residency in Washington (the state). 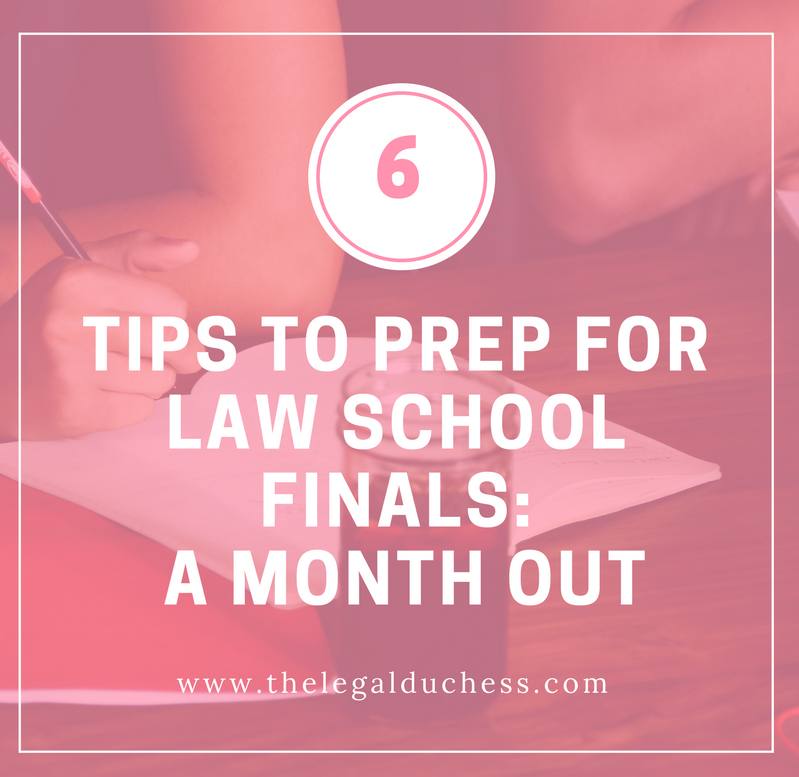 Is there any advice you have on prepping yourself for the LSAT. I have been working on reading a lot of books to improve my reading speed and I bought some LSAT flash cards. Hi! Thank you so much for reading my blog! My suggestions for LSAT self-study is to start really early. I used a review book and worked an hour every day religiously. Once I finished the review book, I started doing weekly full, timed practice exams. By the time I took the LSAT, I had not only learned the methodology to getting the questions correct but I was comfortable with the length of the exam, the question style and I was able to finish well within the time limit. I hope this helps! Hi I’m Brandy! I am a 3L law student with a love of history, novels, and good tea. I am a dog mom, a midnight cookie baker, a proud Gryffindor, lover of high heels though still a country girl at heart and wife to my high school sweetheart. Welcome to my perfectly imperfect life! This blog may contain affiliate links. All opinions and suggestions are completely my own. Some posts may result in compensation for The Legal Duchess.